You’ve created four worksheets, and they're communicating important information that your boss needs to know. Now you need a way to say, "Hey, here’s the deal. See how we've got negative profit in Tennessee, North Carolina, and Florida? This is one of the reasons why." Tableau has an app for that, or at least a sheet: It's called a dashboard. You can use dashboards to display multiple worksheets at once, and—if you want—make them interact with one another. You want to emphasize that certain items sold in certain places are doing poorly. Your bar graph view of profit and your map view demonstrate this point nicely. Click the New dashboard button. From the Dashboard pane on the left, drag Sales in the South to your empty dashboard. 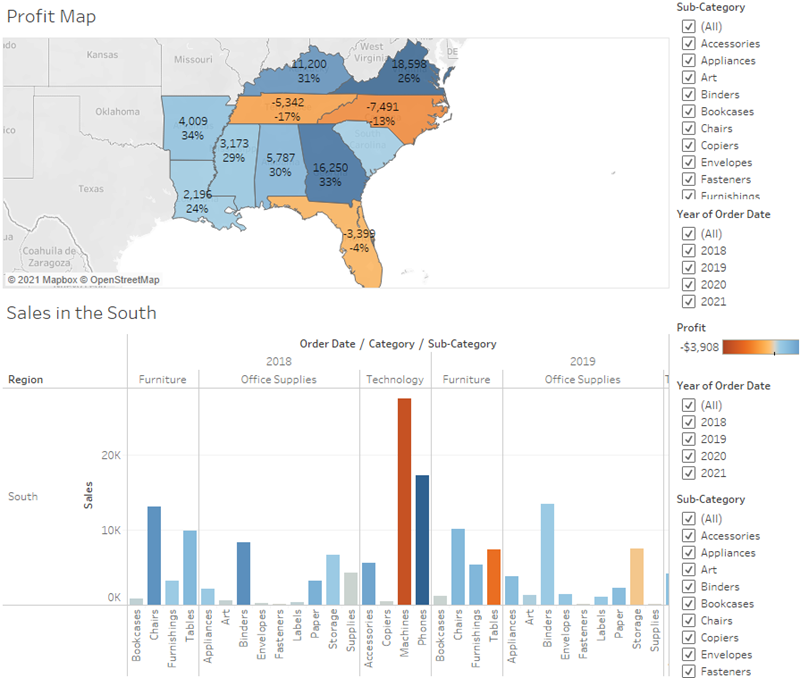 Drag Profit Map to your dashboard, and drop it on top of the Sales in the South view. Now you can see both views at once. Nice! Sadly, the bar chart is a bit squished, which isn’t helping your boss understand your data. It's not easy to see details for each item in Sub-Category from your Sales in the South bar chart. Plus, because we have the map in view, we probably don't need the South region column in Sales in the South, either. Resolving these issues will give you more room to communicate the information you need. 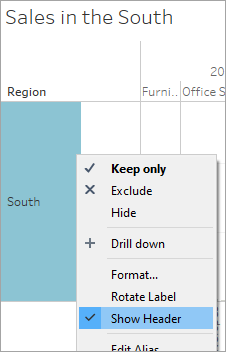 On Sales in the South, right-click in the column area under the Region column header, and clear Show header. Repeat this process for the Category row header. Right-click the Profit Map title and select Hide Title. The title Profit Map is hidden from the dashboard and more space is created. Repeat this step for the Sales in the South view title. Select the first Sub-Category filter card on the right side of your view, and at the top of the card, click the Remove icon . Repeat this step for the second Sub-Category filter card and one of the Year of Order Date filter cards. Click on the Profit color legend and drag it from the right to below Sales in the South. Finally, select the remaining Year of Order Date filter, click its drop-down arrow, and then select Floating. Move it to the white space in the map view. In this example, it is placed just off the East Coast, in the Atlantic Ocean. Try selecting different years on the Year of Order Date filter. Ooh, your data is quickly filtered to show that state performance varies year by year. That's nice, but it could be made even easier to compare. Click the drop-down arrow at the top of the Year of Order Date filter, and select Single Value (Slider). Learn more: Differentiate Floating vs. Tiled objects on a dashboard. Objects on a dashboard can be set to either Tiled or Floating. Tiled items are automatically sized to the zone you drop them in. Floating items can be moved and sized freely from other objects on the dashboard. If you want, you can even have both floating and tiled items on the same dashboard. More on Arranging your Dashboard in the Learning Library (in the top menu). That's more like it! Now, you can easily compare profit and sales by year. But that’s not so different from a couple pictures in PowerPoint—and you're using Tableau. Check your work! Watch "Arrange your dashboard" in action. Wouldn't it be great if you could view which sub-categories are profitable in specific states? Select Profit Map in the dashboard, and click the Use as filter icon in the upper right-hand corner. Select a state within the map. The Sales in the South bar chart automatically updates to show just the sub-category sales in the selected state. You can quickly see which sub-categories are profitable. Click outside of the U.S. to clear your selection. You also want viewers to be able to see the change in profits based on the order date. Select the Year of Order Date filter, click its drop-down arrow, and select Apply to Worksheets > Selected Worksheets. In the Apply Filter to Worksheets dialog box, select All in dashboard, and then click OK. 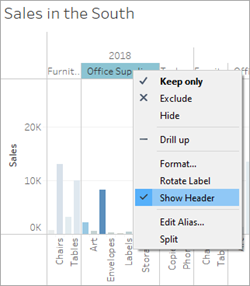 This option tells Tableau to apply the filter to all worksheets in the dashboard that use this same data source. 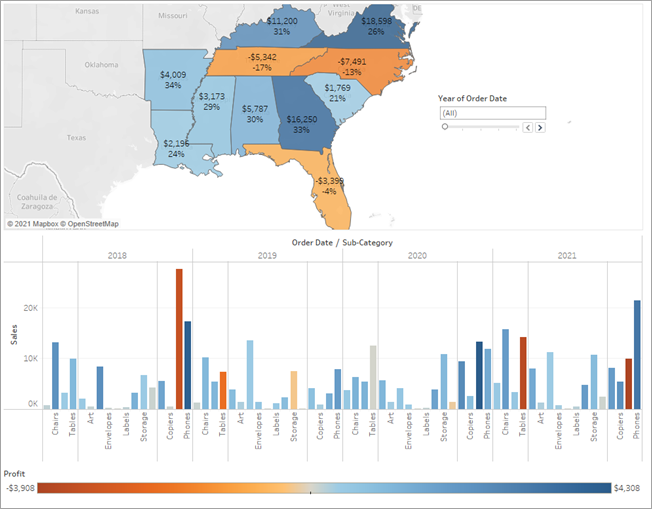 Explore state performance by year with your new, interactive dashboard! Check your work! Watch "Add interactivity" in action. Here, we filter Sales in the South to only items sold in North Carolina, and then explore year by year profit. You show your boss your dashboard, and she loves it. She's named it "Regional Sales and Profit," and you do the same by double-clicking the Dashboard 1 tab and typing Regional Sales and Profit. In her investigations, your boss also finds that the decision to introduce machines in the North Carolina market in 2017 was a bad idea. Your boss is glad she has this dashboard to explore with, but she also wants you to present a clear action plan to the larger team. You're tasked with creating a PowerPoint with your findings. Good thing you know about stories in Tableau. Continue to Step 7: Build a story to present.